Constructing a house is no easy feat, let alone trying to create one off the grid! 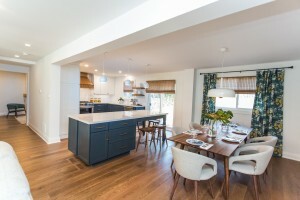 In the third episode of Sarah Off the Grid, the talented celebrity designer Sarah Richardson and her husband, Alexander Younger, feel the pressure as they’re fully in charge of designing and project managing their dream home. Despite fighting against time and rushing to complete the home, the powerhouse couple ran into some problems that were well beyond their control—weather change. The winter season and its unforgiving wrath arrived and forced the progress on the exterior of the house to be delayed. 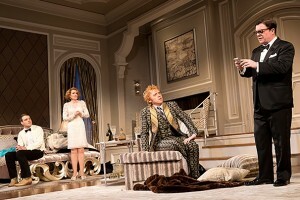 Nonetheless, the interior of the home was moving along steadily! So, without further the ado, let us show you this episode’s standout moments! Sarah’s youngest daughter, Fiona, wanted a green-themed bedroom. Using the patterned-fabric her daughter selected as inspiration, Sarah chose beautiful light green tones and alluring patterns that offered a feeling of femininity and country! And to carry on the theme of using restored and refurbished furnishings throughout the house, Sarah gave an antique maple bed an updated gloss of paint for an added touch of personality! Now that’s a bed we wouldn’t want to get out of! But before we can move on to the next space, we have much to mention the interior finishings! We love the way Sarah used our Fashion Forward Scene III baseboard to add drama to the wall! The baseboards boast a grand size of being 9″ tall, which adds much structure to the space and enhances the luxurious ambiance! She also used chair rail from our Very Square Collection to frame the wall treatment. 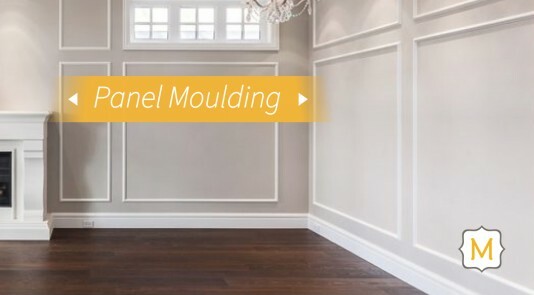 The clean, crisp horizontal lines possessed by both the baseboard and chair rail offer a fun juxtaposed effect to the vertical lines of the tongue and groove wall paneling! Sarah’s oldest daughter, Robin, is described as a dreamer. So, the designer kept that in mind when she put this space together, as she wanted to create a bedroom that was almost cloud-like. Using visually tantalizing textures and beautiful blues throughout the space, Sarah grounded this dream-like haven with rustic, earth tones found on the headboard, mirror, and picture frames, as well as the refurbished chandelier. The same baseboard and chair rail from Fiona’s room is also used in Robin’s space. Much like in Sarah’s other daughter’s room, the interior finishings here not only add structure and visual interest but also elevates the room with added luxe! Now, we’d like to stay in this space and daydream our days away! Hallways deserve attention and love too! After all, they are the tunnels that connect the spaces within our home together! Sarah chose a vibrant, neutral-toned wallpaper and an antique wall table to give this area a rustic charm that exudes historical beauty! Not to mention, we love the blue accents on the staircase as it adds a pop of character! 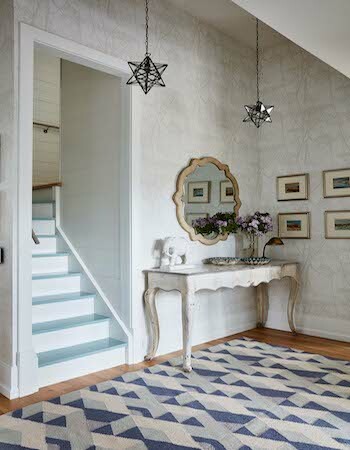 We adore the contrast in this hallway, from the antique rug to the wallpaper and the tongue and groove wall paneling at the staircase, all of which works together to form an explosion of visual interest! Now, take some inspiration on how you can glam up your hallway! 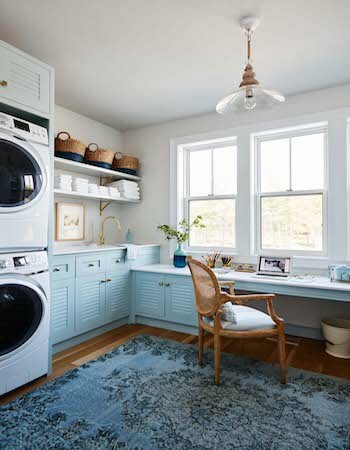 Sarah’s long-time design collaborator Tommy Smythe described this laundry room as “water and soap,” and it’s clear that Sarah was inspired by that statement. A cascade of cheerful blues offers a symbolic representation of water, while crisp whites are depictive of soap! How fun! Now laundry doesn’t have to be a boring chore in this space! This space also triples up as Sarah’s new home office and a place to do crafts and projects with her two daughters. Overall, these rooms demonstrate a mixture of practicality, personality, and Sarah’s trademark designs—history revamped! And we adore it! Make sure you head on over to HGTV Canada to watch the full episode or browse through the gallery! And don’t forget to tune into the show on Sundays at 10pm EDT! You won’t want to miss the upcoming moments! Meanwhile, if you’ve enjoyed our recap of this episode’s memorable instances then take a look at our summary of previous episodes. Also, be sure to head back to The Finished Space for a recap of the upcoming episodes!